Microsoft Bing, the Redmond, Washington’s search engine and app, has an update rolling out for Android users that brings a lot of improvements. Along with an overall improvement in the search experience, this update to Bing also brings support for Android App Shortcuts. Now you can long press the app to open new tabs, save images, and start a new search. Search results in Microsoft Bing are also improved with this update. Searches are new faster with the search results being more accurate and more clearly laid out in the results view. Microsoft has begun rolling out a significantly revamped Bing for Android app to the Play Store. The update brings a new look with a simplified search experience, a color refresh, and quicker access to specific content in search results. The update also expands the search results you can get from the app such as searching for GIFs and being able to save them to your favorites. While most Android users tend to think about Google Search on their devices, Bing remains the number 2 search engine in the United States and for those who are deep into the Microsoft ecosystem, especially Windows 10 users, this update to the Bing app will be a welcome update. The Bing search app for Android has a small but nice update rolling out to users today. The update is version 6.8.25183598.D2C for those keeping score at home and who like to play version number Bingo. On the surface, you are not going to find massive changes. Functionally the app is the same as the previous version. However, when you do a search, the results page are much more aligned to what you see when you use the desktop search in your browser. Search results now offer a mix of links, branded results (if you are searching for a brand) and photos. The idea is to bubble up not just text links to information but also provide more relevant media too. 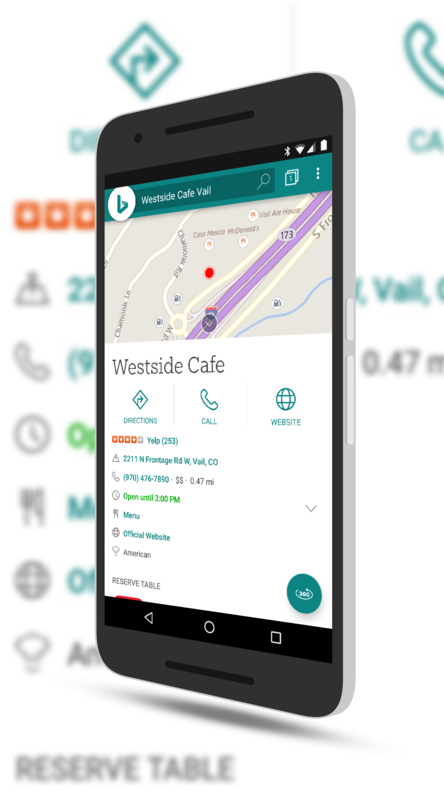 Microsoft has rolled out an update for their search app Bing for Android today. The update is versions 6.7.25183495 for those keeping score at home and on the surface, you won’t find much different from the previous version. There have been a few UX design improvements but overall, not much to see here. The big news is deeper however in the improved support for accessibility. Bing supported accessibility features in Android previously but they were limited. With this update, accessibility support can be found throughout the app, not just searching. If you are one who has various accessibility features enabled on your phone, this update to Bing will support many of the settings including TalkBack and Magnification gesture. Microsoft has begun rolling out a nice update to their Bing search app for Android. The update brings improvements around the travel results for places to go and the best time to go to those places. This is very similar to Google search which has a bar graph that shows you when a location is busiest. Along with the improved time suggestions, the app also gives you tips and guides and one-tap directions to the location from your current location. search solution, this is certainly good news. Bing has continued to make solid strides in the search space over the past two years and while it is certainly behind Google in overall usage, those who are deeply tied in to the Microsoft ecosystem continue to leverage it for their search needs. In addition to the new location information, this update also gives warning about malicious websites and has a homepage gallery filer. This feature allows you to filter and find your favorite Bing homepage images. If you haven’t checked out the daily images from the site, you are missing a treat. Some of them are spectacular. If you have the app installed then you can expect the update to hit your phone over the course of the next few days. Microsoft has rolled out a nice update to their Android lock screen app, Next Lock Screen. The update brings full integration of the company’s Bing search engine (which has had a big resurgence as of late) into the app so you can do search while your phone is still locked. The updated build is version 3.7.1 for those keeping score at home and if you have the app installed, the OTA update for you should be coming over the next day or two. Once you have it, you will be able to tap on the Bing logo on the lock screen and do a search without having to unlock your phone. It is a handy feature if you are searching while on-the-go. While Android devices have quick and easy access to Google search, having alternatives on your phone is never a bad thing. The Bing search app from Microsoft has been available for Android for a while now and it, like many of the Microsoft apps for Android, continues to grow and mature nicely. The latest update to the search app brings a music discovery feature that allows you to find the song you hear in your local coffee shop or other location. Like other apps, you simply turn on the app, hit the Music button and have Bing listen to the song. Within a few seconds it will return the result, giving you the song title and artist. You can then tap on that information at the bottom of the screen and get more details about the song, artist and albums that are available from that artist. On most songs you will also get the lyrics for the song.